The quiz structure is a tricky. Es una aplicacion muy interesante. He ampliado mis conocimientos. The quiz had a confusing table that remained across most of the questions, but had nothing to do with the questions. This should be taken out. Otherwise, a great lesson. Very nice! 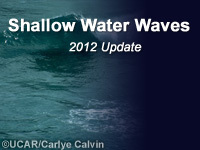 The shallow wave calculator is especially nice tool! Excellent module. Enjoyed it. Nice and simple explanations, supplemented with good pictures and videos. Overall, very good. The module could have used better explanations on how to use the shallow water wave tool and nomograms, along with more examples of using them. I would highly recommend this course for personnel working in the littoral zone, the depth and overall explanation of the materials can be used quite extensively.